The messages on our iPhones can contain anything from cherished memories to crucial information a lawyer might need to present to a court judge during a legal dispute. Thanks to iMazing, you can print entire conversations or chats from your computer: threads from the iPhone Messages app (including photo attachments), or group chats from WhatsApp, all are very easy to print from your Mac or PC. Once you've downloaded and installed iMazing, launch it and connect your device. To view the most recent messages, you will need to click the refresh button.. This will update your device's backup, from which the most recent will be pulled and displayed.  Tip: to access your text messages and chats, iMazing reads data from your iPhone or iPad's backup. If you haven't backed up in iMazing already, the first backup will take some time. Check Show contact details (optional) If you are printing messages for legal matters, make sure to check the Show contact details checkbox at the top of the conversations list. This will add the sender's phone number or email account to every message you've received, and include your own phone number in the header of each printed page. iMazing prints selected conversations in their entirety. 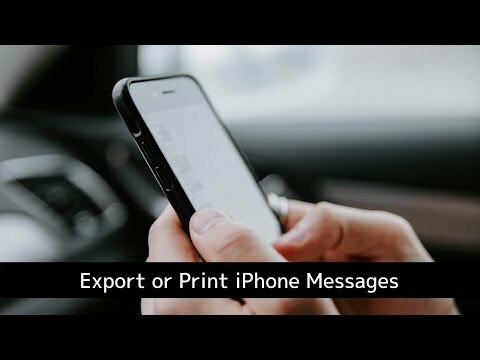 In order to print specific messages only, select them now.  Tip: the CTRL/Command, or SHIFT keys can be used to select several conversations or messages at once. Use this to bulk-print or choose specifically what to print. Scale can be used to customize message font size as well as images from a range of 30% to 300%. Add export metadata in footer can be used to give more legal weight to exported messages. The footer of every page will include the iPhone's name and serial number, the date of the export, and the last modified date of the WhatsApp database from which the data was extracted. iCloud sync of Messages was introduced in iOS 11.4. If you have this option enabled, iMazing will still be able to display and extract your messages like before, but some older attachments may be removed by iOS from your device and kept in the cloud. Text content is not affected.